Our benches in this range come in different styles and colours, but whichever one you'd like to order, we'll deliver it for free. Lazy Susan works with Geodis and Parcelforce, the latter dealing with deliveries of garden benches, generally. Parcelforce can offer next day delivery when an order is placed before midday, although this is not guaranteed and depends on your postcode (contact them directly for more information). They will send you a text message on the morning of delivery to let you know in which one hour time slot they will arrive. They also have a map on their website that allows you to track your delivery in real time. 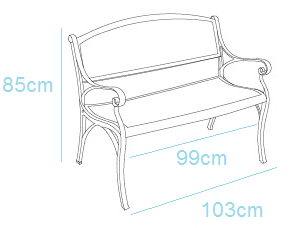 So as you're having a look at our garden benches, the price you see is what will be on the checkout page. No extras for shipping. The Jasmine bench is one of our best selling cast aluminium garden benches, with dozens of positive customer reviews. Its simple lattice design on the seat and backrest follows the contours of the frame. As for colour, choose from Antique Bronze, white, Slate Grey and sandstone. 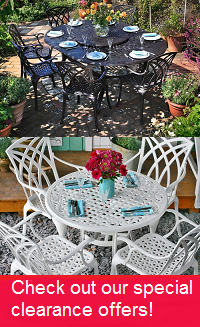 Another popular choice is the July bench, with ornate triangular lattice metalwork. Thanks to its cast aluminium construction it is light as well as weather resistant. The Rose bench and Grace bench are the last two 2 seater garden benches that we'll mention here. The Rose bench takes is name from the floral design on its backrest. This design matches those found on some of our other items, such as the Rose bistro set. The Grace bench has a simpler, sleeker design and is ideal for people looking to give their garden a more modern look. Both sleek and robust, they are comfortable benches available in Antique Bronze, Slate Grey, white and sandstone. Our outdoor benches are made from cast aluminium. This is the optimum material for garden furniture. Unlike wood it doesn't rot or split, and unlike cast iron it doesn't rust. You may need to sand and coat wood in weatherproof paint, and similarly coat or cover iron furniture to avoid weather damage. Aluminium patio furniture will be fine outside all year round, with no maintenance required. So if you're looking for a quality garden bench that's weatherproof, look no further. We've made it easier to accessorise your bench, with some discounts right on the same page. Underneath the main product information are our discounted offers. Get a side table for your bench, a bistro table or another kind of garden table at 80% to 20% of its original price. Below these, select bench cushions at a phenomenal 60% off. They are made from durable acrylic, with a zipped side for easy removal and washing of the cover. The bench cushions are available in stone, terracotta, green and blue. We can send you fabric and metal samples if you would appreciate a look at the colours and materials before you buy. Just get in touch with our customer service team, and they will be glad to send these out to you. Give them a call or send them an email if you have any other questions, too. They're available from 08:00 until 18:00 every day to help you. Call us on 01243 717197 or email us at [email protected]. We try to answer emails within 2 hours during office hours.